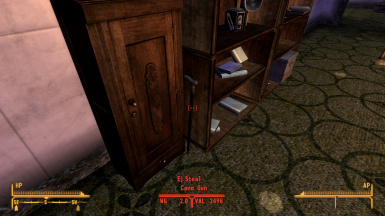 A single-shot holdout weapon disguised as a dress cane. This version is the weapon as it was intended to be. Real cane guns are often single-shot breech-loaded weapons chambered for large, low-pressure handgun ammunition or shotgun cartridges and 12 Ga. seemed to offer the right balance between damage potential and ammunition scarcity. This version does less damage than the 12 Ga. version and has a wider spread, but ammunition is more plentiful around the wasteland. This version turns the cane gun into a silenced .22LR rifle. It does the least amount of damage per shot (equivalent to the .22 SMG) but is completely silent. 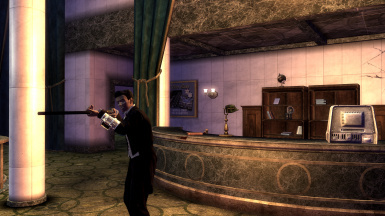 All three versions place a single cane gun in the same place - leaning against the shelves behind Mortimer at the Ultra-Luxe. It must be stolen. See the included screenshots for the exact location. Also note that if you want to use it right away, you'll have to bring your own ammo. I didn't place any near the weapon itself. 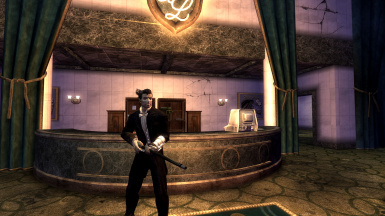 Version 2.0 - Taking a suggestion from char97, I made the Cane Gun a craftable weapon that you can make at any workbench as long as you have a Dress Cane, a Repair skill of 30 or higher and the correct donor gun for each caliber. To make the 12 Ga. version, you'll need a Hunting Shotgun. To make the 20 Ga. version, you'll need a Single Shotgun. To make the .22 LR version, you'll need a Silenced .22 Pistol. Note: Version 2.0 does NOT add the gun to the game world, it is only a collection of recipes that you'll have to make yourself. 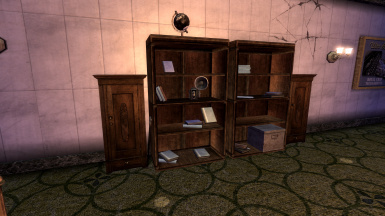 Extract all the files in the archive to your New Vegas data folder (which is the same folder where FalloutNV.esm is located) and then enabling the ESP either in your mod manager of choice, or under "Data Files" in the launcher that runs when you start up New Vegas. The mesh I made myself by modifying the dress cane melee weapon. 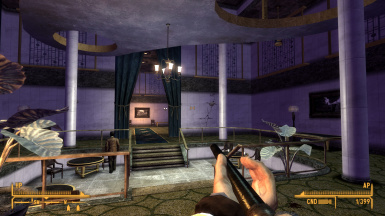 It uses the hunting shotgun's reload and firing animations because in my opinion, those looked the best.